Goodridge 600-02 small bore hose. If you need a hose that has a very small bore and is able to withstand very high pressures then maybe the 600-02 series hose is what you need for the application. We can provide the 600-02 hose with adapters that will then allow a host of other fittings to be attached. 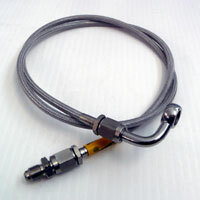 In the example image you can see a 600-02 hose with adapters which allow other fittings to be used such as the 3/8ths male and also the 90 degree banjo shown.